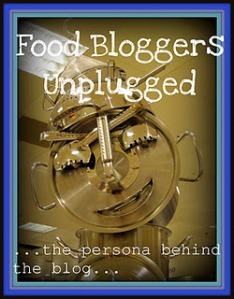 Yesterday I was tagged by the lovely Alison of Hungry Squirrel Cakes to take part in Food Bloggers Unplugged... the persona behind the blog. So if you want to find out more about the weeble behind 366 Recipe Challenge, read on! It was my cousin, the lovely @BridestockBride. She started her blog about her impending nuptials and on Fridays has a feature called Foodie Friday. The recipe that really inspired me to start my challenge was the first thing ever cooked for her by her fiance (Mr Bridestock) - Chorizo and Butter Bean Stew. My mum taught me to cook although a lot of my earliest food memories involve hanging around my grandmother whilst she made pies and crumbles waiting for bits of Bramley dipped in sugar for 'her little donkey'. All my staples are from my mother - spaghetti bolognaise being my favourite - but now as I'm getting more into cooking, they have the 'Lil Ms Squirrel' twist. The most popular recipe she's ever given me is her Bakewell tart which everyone I make it for always raves about - especially my current boss. Sleb chef wise, I'm a fan of Thomasina Miers, Dan Lepard, Mary Berry, Lorraine Pascale and Nigel Slater. Not necessarily in that order - it changes with my mood. I also have a bit of a crush on James Martin. It's something about Northerners who like fast cars and food that does it for me. If there's one chef that's not inspired me, it's St Delia as I've tried several of her recipes and only been pleased with the results of one. My oldest friend is Mary Berry's Complete Cookery Book, however these days it's my phone or the husband's iPad that tends to be in the firing line of food splatter. Mostly so that I can research and take the odd photo whilst I cook. I have a dream to go on a foodie world tour and eat in lovely restaurants in Spain, Italy and Mexico to name but a few. I'd also love to go to Canada although I'm not aware of anything particularly foodie from Canada other than their pancakes. I've not travelled that much since I've been older and more into food. And being married to someone who eats to live rather than lives to eat, my opportunities have been limited. My favourite eating country so far has to be France because of the pastries and the crepes and the beautiful savoury galettes in Brittany and the way they know how to cook a decent steak even in the crummiest of hotel restaurants. From one squirrel to another, it would have to be Alison of Hungry Squirrel Cakes' table. Especially if she's making lasagne :) And then pudding either with Weekly Bake Off or Maria of Maria's Kitchen. Or maybe afternoon tea with Nelly of Nelly's cupcakes. So many food blogs, so little time! I'm such a sheep, but I'd love a KitchenAid in Boysenberry or Lime. However if money is no object, I would love a new kitchen full stop, please Santa. My lovely mum who gave up her career as a pastry chef when she had me at 22. Chicken, leek and mushroom pie. I stole this recipe from an ex and now pass it off as my own. It involves lots of pastry and double cream. Served with lightly steamed asparagus. Bacon flavoured Walkers crisps followed by Maltesers - but they have to be the ones that come from a box. The ones in the packet just don't taste quite the same. I don't like pizza. I love bread, I love cheese, I love all the toppings. But if I have to go to somewhere like Pizza Express, I'll always have the non-pizza option. 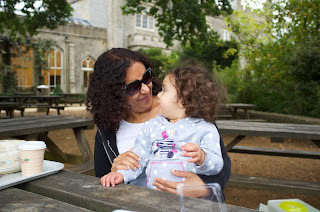 Lovely picture of you and daughter. No pizza? really!